This Pittsburgh Penguins Stadium Series Gold RBK Premier Sidney Crosby jersey comes hand-signed by the Pens superstar Captain. The 2017 Stadium Series was played at Heinz Field between the Pittsburgh Penguins and the Philadelphia Flyers. The Penguins managed a 4-2 win and Sidney Crosby opened the scoring with the game's first goal. This was his first ever NHL goal in regulation during an outdoor game. After the game Crosby was asked about playing in these types of events and responded with "Not everybody is as lucky to play in these kind of events, so to do it at home, to have friends and family here, to take in the whole experience with the guys, I think it's exciting, and those are things you're fortunate to be part of," Crosby said. "When you're able to win, it's always better.". The attendance for the outdoor game was announced at 67,318 making it one of the most attended NHL outdoor games in history. This signed jersey is a limited edition of only 87 ever done. 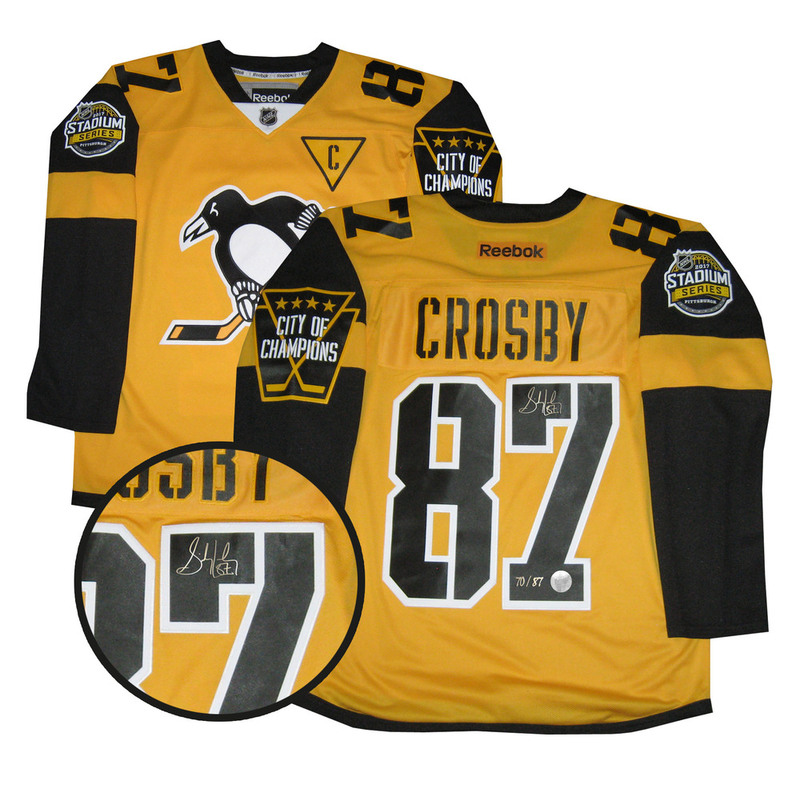 The jersey is personally autographed by Sidney Crosby himself and witnessed by a Frameworth representative for authentication. A Frameworth hologram and certificate of authenticity are included to ensure the legitimacy of the signature. This item is in-stock now and ready to ship. Limited quantities are available as this jersey is special limited edition of only 87 that will ever be autographed.